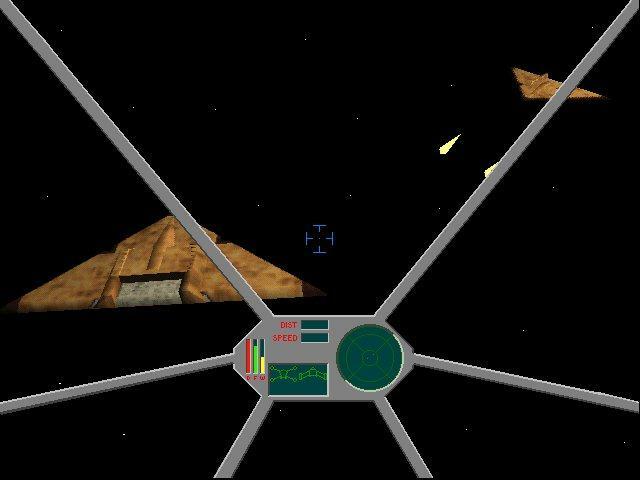 It is a 3D space combat simulator with which you can fly a starfury in the famous Babylon 5 universe. It uses 3D hardware if available und runs in the 640*480*16bit full screen or window. Ok, ok! it is not a profesional product like wing commander or others. So please expect not to much. It is in an early development state, so there is currently (6/98) only three missions which earns the name scenario. But beware if you expect to fly the fury like a aeroplan, it works different! The mechanics are based on a Newton like principle (like it is in the TV show). So you need a 3-axes joystick with a thruttle for best playability. But a keyboard also works. You must have a PC with a 3D accelerator card or a quite fast processor. Then you should have a soundcard. And the most important thing is, that you must have a workable installation of DirectX Version 5. A 3-axes joystick with throttle (like the Sidewinder) is recomended but any other joystick and the keybord should work also. If you match the requirements than download the Programm (click on the screenshot) an expand the file in a directory on your disk. Then simply run furysim.exe and pray. The program was written for my own pleasure and so it is possible that it doesn't fit to your hardware. If you have a guess why it does not work then send me a mail. I am the author of this game and do have the source code. That means I can fix bugs (not like profesional companys who want money for beta software!) if I do have the time. Also, if you have some sugestions for missions or other ideas which would improve the program then again mail me. Legal issues: This is not profesional product but a product of my spare time. I will not be responsible for any damage this program would do to you or your computer. Sorry but I have to say this. Also I have to mention that Babylon 5 is a copyright of Warner Bros. As far as I know it is no problem to use the name as long as I make no profit with it. If some company has a legal problem with something from this site. please tell me before sending any lawyers. I'm shure there are a lot. Tell me so I can perhaps fix them. I will upload newer versions of the game if ther are enough changes or expansions that justify the costs. - there seems to be a problem with several joysticks. At least the Microsoft Sidewinder should work fine.